AMD's future Navi GPUs, the successor to Vega II, may have the power that enthusiasts are looking for. Rumor has it that the new Navi GPUs may launch later this year, with a follow up Navi 20 GPU launching next year, according to YouTube channel RedGamingTech. More importantly, the GPU is expected to offer improved performance and even ray tracing on par with the Nvidia GeForce RTX 2080Ti, Wccftech suggests. Earlier this year, AMD launched the Radeon VII graphics card, without confirming whether the new GPU built on 7-nanometer architecture was actually Vega II or still considered part of the original Vega family. In any case, the Radeon VII may just be a stopgap, as it doesn't perform competitively with Nvidia's best graphics card, the RTX 2080 Ti. The new Vega architecture should help push AMD's performance ahead of where it currently stands, and this isn't the first time we've heard a rumor that Navi could arrive late this year. Given how competitive the Radeon VII is with the RTX 2080, Navi could be big. The first iteration of the new GPU architecture, Navi 10, is expected to be a mid-tier offering, and a version of the Navi 10 could be used in future consoles. Though the new Navi GPUs are believed to have an improved GCN architecture, it may still leave Nvidia's expensive RTX 2080 Ti at the top of the pack. 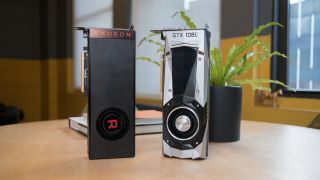 But, the Navi 20 version that's rumored to come a year later could shake things up by bringing even more power and AMD's own recipe for ray tracing. Then, we'd just have to wait and see whether Nvidia has a response in the form of new RTX GPUs.